After posting my book recommendations at the end of 2016, I made a goal to try posting them on a more regular basis. I don’t read enough books often enough to make it every month, but I thought I could try every quarter. And then April came and went without me posting, so I decided I’ll post triannually, since no one really uses that word anyway (even Wiktionary tried to get me to just say “three times a year”) and pregnancy and BYU-Idaho stole the word trimester. I slacked a little in reading. One, because I got LASIK and my eyes got tired at night the first 2 months (what the heck?) so it was hard to stay up wicked late reading. Two, because I don’t have to justify how I spend my time! Booyah. I was actually doing a lot of grading papers this semester since I do part-time work with U’s MBA program. Speaking of which, why don’t I just measure in university semesters? Too late, I already typed it. At the suggestion of a friend on my last post, I’ll also include which of these were audio books and if I liked the reader or not. Feel free to comment with any other suggestions you think of for making these reviews better! I like to put Miss Lucy Maud in her own category because she definitely IS her own category. I hadn’t branched out of the Anne of Green Gables books until last year when I tried The Blue Castle. I had simultaneously purchased the “Emily” books when I bought that one, because I was just sure they belonged on my shelf, even if I hadn’t read them yet. It’s a little hard to consider the magic of another young, precocious, coming-of-age woman in Prince Edward Island without just wishing that it were about Anne. But after a few chapters, I still grew to love Emily. She’s not as much of a troublemaker and she aspires to be a writer. I read up on the writing of the book, and Lucy wrote this at a time when she was copying her journal from earlier years. This heavily influenced the book with biographical elements. The first book explores Emily’s life as she goes to live with her two aunts in New Moon. She makes new friends and her friends are wild and her adventures are only something Lucy Maud could invent. Emily’s intrigue often lies in “The Flash” of inspiration she experiences throughout her life. Don’t read the summary of the second book here if you don’t want to know anything about Emily’s life. In the second book of the trilogy, Emily aspires to go to Queen’s Academy. Her rigid aunts protest, but consider changing their minds if Emily will give something up that is very dear to her. Will she do it? Time will tell (suspenseful music). I actually didn’t particularly like this book as much. There is a certain character woven throughout this book that disturbed me. While I cheered for Emily, each mention of the other character brought a level of discomfort. Emily starts to live her life and aspires to make it on her own as a writer. As one who understands what this feels like, I get the pain of rejection letters, the inspiration of a new idea, and the difficulty of critique. Emily also seeks to understand what it means to love and who she loves and why. I held out hope for my little Emily in this book that she would find that love. You would think that I’m a prepper for reading so many end-of-world/disaster books. Alas, maybe I am. I mean, I do have food storage. But that could also just mean I’m Mormon. The reality is that part of my job is product management for the Emergency Preparedness division of LDS Charities, and these books were recommended to me to help understand the complexities of disasters. This incredible book follows the journey of the employees and patients at Memorial Medical Center in New Orleans, LA, following Hurricane Katrina. This is a fairly long and detailed book (I wondered how it could be so long in just talking about 5 days–you’ll see) but it was gripping. Due to the circumstances and the triage system in place for evacuating patients as the situation worsened, several doctors and nurses were accused of euthanizing patients–perhaps for comfort, perhaps because the patients were too far gone, perhaps for ease of evacuating those who they thought could survive. This book bounces you back and forth along the ethics lines and has you agreeing with some of the decisions one moment and being shocked the next. It had me agreeing that the extenuating circumstances of the disaster put physicians in situations that were impossible to rationally determine, but then five seconds later had me being appalled at the abandonment of medical ethics. It’s a rough journey but a fascinating one to understand as these situations shape medical disaster ethics policies. One Second After is a novel that follows what would happen “one second after” an electromagnetic pulse, which essentially shuts down…everything. After reading a series of books last year (The Great and the Terrible) about the possible threat of an EMP, I’m actually quite terrified by the possibility. It would drastically change our lives and throw us back more than 100 years into history, but with less of an ability to successfully live life as they did then. Can you imagine the chaos? The protagonist is a retired Army Colonel who teaches at a university in a small town in North Carolina. He is a widowed father with two daughters. His knowledge of defense puts him in a position to help his town work together to protect themselves and their food sources as they try to live a life without electricity or any modern conveniences. It is distressing and concerning in many parts, and perhaps a little too dramatic in other parts, but it is a novel, so there you go. I’ve heard there are other books following this one, but I’m not sure I’m so inclined to check them out. (Audiobook: I liked listening to this reader. Also, by listening, I learned Ove is pronounced Uva. But also by listening there were lots of swears. So…tough one to recommend on the audio book). I was initially put off by this book because it’s about a grumpy old man and all his grumpy old ways. I was kind of like, “I know way too many people like this in real life to want to spend time hearing about it in a book.” But I kept listening and it turned into a delightful, funny, little book. And I cried. Because there’s a lot of sadness, too. It just reminds me of how everyone struggles with something so we just need to be kind. But really. Just be kind. This is one of those books that you read and say, “There is a lot wrong with this world.” But then you also say, “I need to find a way to make a difference.” This memoir chronicles the life of a white kid raised in the Rust Belt among abuse, alcoholism, drugs, and poverty. Yet somehow he broke free to become a Yale Law School graduate. While it is largely about his own experiences, he does draw from some research about the poor white working-class Americans and this disintegrating demographic. It’s shocking and sad. It reminds me of some of what I see even here in Salt Lake. I was particularly intrigued by his thoughts on upward mobility–we often proclaim education as the way out of poverty, and it is, but if a child doesn’t have any help or motivation to get that education, it’s a moot point. Children need loving adults and mentors to help them get through the complexities of education and, of course, life itself. Strong families and relationships may be the most powerful change agent of all. That is something I sincerely believe and found it interesting as a theme in this memoir. Are you even surprised I would have read books about Jerusalem since I was going on a trip there? This book is incredible. There are probably a million books about Jerusalem and I really haven’t read but one or two of them, but this was recommended to me and it was a work of art. This book uses some of Montefiore’s own papers (I learned of this family’s importance in Jerusalem) as well as new documents and current scholarship to describe the chronology of Jerusalem up until the Six Day War. I half recommend listening to this book because otherwise you may not ever get through it (it’s very detailed and heavy reading–I started out reading it paper copy but couldn’t get very far very fast), but I also maybe recommend just reading it because maybe it will cement things more. There was so much in this book that I don’t know that I retained more than 2% of it. Maybe 3%. But I did come to understand all the different time periods better. I got through a significant portion riding on the bus in Israel and finished when I got home, which made it all the more fascinating. Apparently Montefiore did a BBC Series on Jerusalem after this book, so maybe I’ll just watch that to capture more facts. This book is where I first learned of the Jerusalem Syndrome, though, so I was glad to be enlightened to that literal insanity. I actually don’t know if I got through this entire book, as it’s organized by different geographical areas so you don’t necessarily read it straight through. My tour guide in Israel, Garland Dennett, put this book together to help us study before our trip. I actually gained the most use of it by spending time the night before we went certain places looking at where we were going and rereading it when we got home at night. Much of what I’m working on in my Israel posts is being refreshed by reading this book. It’s got some of Garland’s personal stories and experiences in it as well, which is so fun to learn about. It is a visitor’s guide, so if you are thinking of going to Israel, I would recommend this book, since you can get it on your Kindle. Well, this book isn’t really a Jerusalem book, but it also kind of is. It’s a little book dedicated to helping you focus on Easter and get more out of it since it’s not as big of a holiday as Christmas is. It’s written by the same author who wrote A Christ-Centered Christmas. I really liked the Christmas one and gained a lot from the way it made me think of things differently, but the Easter book isn’t quite as compelling. It was a copycat and it kind of felt like a copycat. But the ideas are still nice. 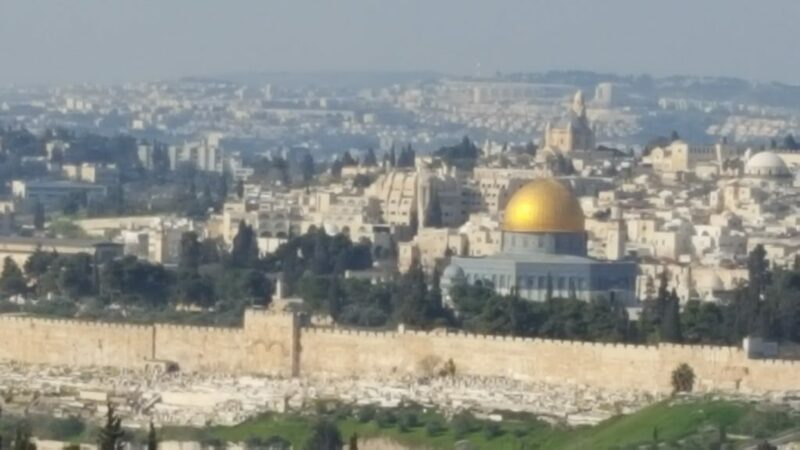 Plus, this year was already one of my most focused Easters ever, largely because of my personal experiences visiting the Holy Land. That’s all for now, folks. I’ve already got 1 1/2 books down for the start of the next round, so we’ll see you in a few months (for the book posts at least). One of the most enjoyable “listens” in a long time for me was Good Omens, by Neil Gaiman and Terry Pratchett. It is a totally off-the-wall comedy (think Douglas Adams’s books) about a devil and an angel who have been “friends” on earth for millennia. Armageddon is coming soon, but the antiChrist has been misplaced. Who will find him first? Loved loved loved the reader.